Derek: His ICP went through the roof. We did everything...everything. Owen: Chief, his organs are viable for now. It won't be long before he's acidotic and hypothermic. Is he a donor? Richard: Um, ah... I don't know. I called his mother. She on her way. Let's close him up and get him to the ICU in case she wants to see him. Alex: Woah, woah... she wants it out. Can't we take it out? Cristina: She's breathing over the vent. Richard: Alright, let's pull out the tube. Anybody know if he's a donor? Permalink: Anybody know if he's a donor? Stevens, can you hear me? Look at me Stevens! Permalink: Stevens, can you hear me? Look at me Stevens! Damn it O'Malley, come on. Live. Permalink: Damn it O'Malley, come on. Live. 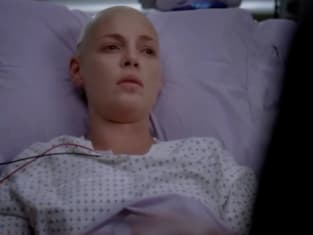 Izzie: [laughing] George is dead! He's dead! They're about to put him in the ground and the priest is doing classic rock lyrics! And that girl, that redhead, is crying harder than his mother and she never even met him! Cristina: You are far more twisted than I ever realized. Izzie: You got married on a post-it! Meredith: I got married on a post-it. Cristina: You guys got married for real! Alex: O'Malley got hit by a bus!